And that’s obviously not good news with regards to the World Cup, especially as those sleepy starts have been a thing reserved mostly for high-profile games when expectations are high and nerves are tense. … and now this. There’s a pattern, amongst them. And the Australian inability to lead at half-time against Iraq (home), Thailand (away) and Saudi Arabia (home) somehow finishes off the whole picture, with the fact they had taken an early lead in the latter two games making the #numbers only more peculiar. The absence of Mile Jedinak is unfortunate for sure. Even though yours truly finds the veteran’s importance to the Socceroos somewhat overstated at times, it’s undeniable he was an important cog for this formation to work towards the oh so important home wins against the UAE and Saudi Arabia. 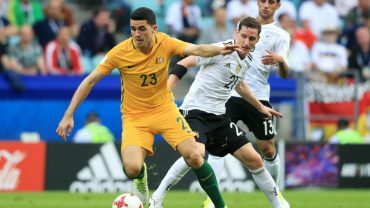 His positional cautiousness and internationally tested experience are still second to none in this side, hence he remains an asset – especially, if not only, as long as Postecoglou rolls out the 3-2-4-1. However, when you don’t have a Jedinak, why would you at the same time make the situation worse by not using Jackson Irvine, who was also vital in gathering those six points? What was Mass Luongo supposed to do as Milligan’s initial partner? Why was Milligan sometimes helping with build-up as a false LCB, but was nowhere near to be found helping out the struggling pair of Behich and Wright to neutralize Kimmich and Brandt? How was Draxler allowed to dribble some 40 metres through the middle? How does it happen that Aaron Mooy, of all people, tracks back the Germans most often? When you’re clearly not ready to put enough effort in dishing out instructions and coordinating your midfield trio, or unwilling to use his direct natural replacement in James Jeggo, then just don’t go with this formation and – since you can’t make up for his absence – simply wait for Jedinak. Massimo Luongo enjoyed probably his worst day in a national team jersey and, well, these things obviously happen. At the same time, though, one must feel this could have well been a signature “Big Stage” Luongo performance. Largely anonymous and bashful against Brazil too, the Asian Cup hero has just seemed overwhelmed by the constant movement of quality opponents both in and out of possession. And more or less the same, worryingly, goes for Aaron Mooy. On his Confederations Cup debut, Mooy seemingly turned the ball over more times than he had throughout his whole career, mostly given that, apart from second half passages when the opponent couldn’t be bothered to press, his first three steps were always too slow, getting him routinely trapped. But sure, even our very own Iniesta can be caught out on a rare off day. Only that, again, you don’t just lose your pace when nervous. These two individual performances from two very talented guys might as well have simply uncovered their long-lasting limits – a ceiling, if you will. Everyone does have one after all. After the Asian Cup, we all thought Mass Luongo was the diamond of this side. Then there was the steep rise of Aaron Mooy catching our attention. And meanwhile, the media-shy Tom Rogić has been rather quietly proving himself night in night out, usually emitting rare confidence and only this month fittingly bagging the cute key winner against Saudis. Confidence especially rare yesterday when the Celtic star, again, looked by far the most assured piece of the Ange jigsaw. His goal was anything but great, despite our initial reactions (based, surely, on the usual high standard of his goals first and foremost), but it’s fair to acknowledge that no Aussie had even found himself in that area on the edge of the penalty box prior to Rogić’s run. Australia have one easily solvable, but particularly painful problem at the moment, only more accentuated by the special requirements of this formation: their three centre backs do not communicate. Like… at all. Or so it seems. And it doesn’t show only off the ball when dealing with balls over the top, pull backs (oh how easy it was for Germany to get behind the line in the first half! ), but also on the ball, when nobody is being made aware of an opponent chasing him down from behind and when nobody is being offered cover and encouraged to run with the ball to distribute it higher up. How the hell does it happen that when you have three centre backs and Milligan, who was essentially acting like another centre half in patches, you don’t seem to find an adventurous distributor among them as was the case for the whole passage of play when Germany were still all-round active. And how does that happen with Trent Sainsbury in place in particular?